Cara Delevingne is an English fashion model, actress and singer. She won the Model of the Year Award at the British Fashion Awards in 2012 and 2014. Delevingne has walked the ramp for brands like Dolce & Gabbana, Burberry, Mulberry and Jason Wu. She made her debut in the film, Anna Karenina in the year 2012. She later appeared in Paper Towns, and is reported to have played the role of Enchantress in the film Suicide Squad. Born to Pandora Anne Delevingne and Charles Hamar Delevingne on 12 August 1992 in London, Cara came from a wealthy and effluent family. She was interested in modeling from an early age itself. Delevingne’s godmother Joan Collins is an actress. 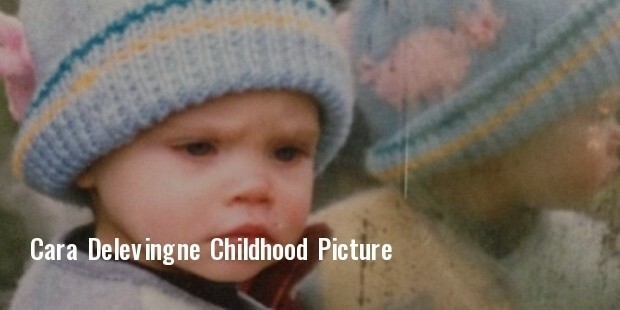 Delevingne made her debut in the modeling world at the tender age of 10, when she shot for Vogue Italia. In 2009, Delevingne was spotted by Sarah Doukas and was signed up by Storm Model Management. Two years later, she was working for prestigious brands, such as, Burberry. This lead to other openings as well. Moreover, being photogenic, Delevingne bagged several other contracts. Delevingne first walked the ramp at the London Fashion Week in 2011. She was a part of the Burberry Prorsum Autumn/Winter collection. Delevingne has also walked the ramp for Victoria Secret in 2012 and 2013. Delevingne has had the privilege of being the ‘Face of Chanel’s Resort Campaign’, along with Saskia de Brauw. Wanting to try other pastures, Delevingne terminated her contract with Storm Model Management to focus on her acting career. She made her debut in the film Anna Karenina in 2012, in a minor role. She has also played the role of Melanie in the film The Face of an Angel. The Face of an Angel was a psychological thriller which starred Kate Beckinsale. The movie received a mixed response from the critics. In 2014, Delevingne first appeared in the television series, Playhouse Presents. The same year she starred in The Feeling Nuts Comedy Nights. Delevingne has appeared in several music videos including, Bad Blood by Taylor Swift and Dope Walk by ASAP Ferg. Delevingne’s love for musical instruments- drums and guitars, is no secret. She has written and recorded two albums for Simon Fuller, and was later proffered a record deal, which she did not accept, as she would have had to change her name. Presently, Delevingne is the face of the Burberry’s Beauty campaign along with Edie Campbell and Jourdan Dunn. She has been termed the Star face by the British Vogue. Apart from walking the ramps for brand like Shiatzy Chen, Moschino, Jason Wu and Oscar de la Renta, Delevingne has designed two collections for DKNY and Mulberry; the sporty look for DKNY, which includes leather jackets and beanie heats, and rucksacks and handbags for Mulberry. The collection also comprises a variety range of purses, iPAd sleeves, phone covers and zipped pouches. Delevingne identifies herself as a bisexual. She is currently in a relationship with Annie Clark, an American Musician. She has auctioned her personal TAG Heuer watch to raise funds for WildCRU.